Do you remember in Part 2 that my nutritionist said that I should divide my plate into 4, with ¼ protein, ¼ carbs and ½ cooked vegetables? Well, I haven’t heard anyone say, “I don’t like vegetables” or “It’s too much of a nuisance to make vegetables”, which is surprising when you see what most people actually eat. And restaurants are certainly not into serving vegetables, not in France anyway unless you also go to the more expensive restaurants. I like good food and will occasionally get pleasure out of spending hours in the kitchen, but it’s not something I like doing two or three times a day. Everyday cooking, in my opinion, is boring. But vegetables obviously don’t appear out of nowhere. In France, we have Picard, of course. This is a concept that doesn’t seem to exist in Oz, to Leonardo’s great disappointment because he’s very keen on whole leaf spinach. It’s a frozen food supermarket where you can buy practically anything, including unadulterated vegetables, and that’s where I got my best vegetable idea from. They have these plastic bowl affairs, a bit bigger than a Chinese bowl, containing three or four different vegetables e.g. broccoli, cauliflower and carrots, or peas, zucchini, broccoli and cherry tomatoes, or carrots, green beans and cauliflower. It has a transparent plastic seal so you can just put it in the microwave for a few minutes and, lo and behold, there are your vegetables, all ready to eat. Doesn’t sound very appetising? You’d be surprised how tasty they actually are. One of the problems with vegetables is that they’re often over-cooked. And a half a plate of carrots or zucchini or green beans is sort of boring. Combining a small number that you can vary at each meal and cook to perfection solves that problem. Buying them from Picard though is expensive and time-consuming at 1.40 euro for 250 grammes so I looked around to see what else I could find. And I did! Ziploc freezer containers by Albal are the answer. 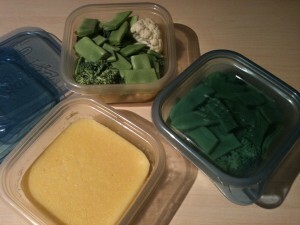 These are square plastic containers with expandable lids that contain just the right amount of vegetables for one person and can be washed in the dishwasher. On Sundays at the market, I buy a range of vegetables (whatever’s available) and store them in my green bags. 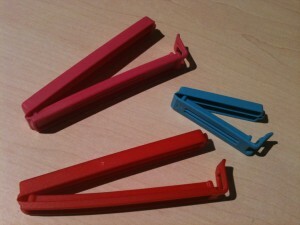 I bet you don’t know what they are. My mother discovered these many long years ago and I stock up on them whenever I go back to Australia because you can’t buy them in France. The funny thing is, I haven’t found any Australians who know about them! 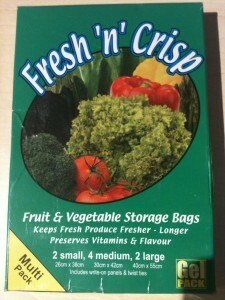 According to the blurb, they “contain natural ingredients which slow down the ageing process of fruit and vegetables by allowing them to breathe more easily. This process decreases the rate of ripening and preserves freshness, vitamins and flavour”. You use a different bag for each type of vegetable. You then expell the air by pressing on them and seal with a twist though I prefer those coloured clip-things you buy from Ikea. You can also wash out the bags after use and keep using them until they get holes in them. This is important if your stock comes from the other side of the world! I could do one of those with and without ads, but I wouldn’t like to waste my broccoli. You know how broccoli goes brown then yellow almost as soon as you buy it? Well, you can easily keep it in a green bag for a week without it changing colour. It’s quite amazing. That way you only have to shop every 8 or 10 days and still have a store of fresh vegetables in your fridge. By the way, it takes about 4 minutes in the micro-wave to cook one container of cut-up vegetables. You have to slice carrots very thinly, zucchini into 1/2 cm slices and the cauliflower and broccoli into 2/3 cm pieces. The other way I like cooking vegetables is in the oven. 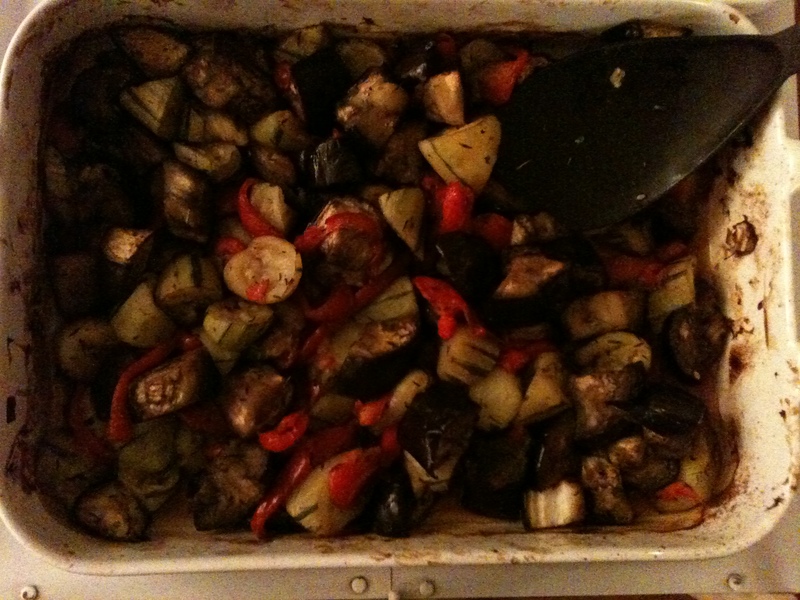 For example, I cut up a couple of eggplants, a few zucchini and and two or three capsicums into chunks (aubergines, courgettes and bell peppers for the non-Aussies), put them all in a large baking dish with a few teaspoons of olive oil and lots of thyme, then into in a 200° C oven. After half an hour, I stir well, then put the dish back in the oven, stirring every 10 minutes (usually another 30 minutes) until the vegetables are cooked. Delicious hot or cold. Also works for potatoes, sweet peas and real pumpkin (as opposed to the sort you find in France). This entry was posted in Australia, Dieting, Food, France and tagged fresh bags, ziploc. Bookmark the permalink. 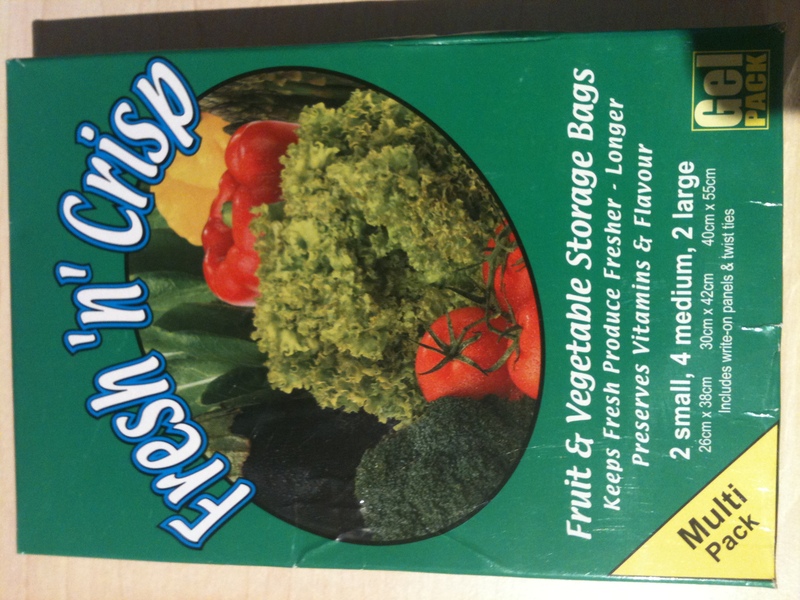 Off to get some green bags – I have seen them in the supermarket but weren’t sure whether they really worked… should save a lot of broccoli. I’ve also been catching up on your earlier posts.I do remember being able to take clothes home “on appro”. Good to see your wonderful photos and learn about your life in France – and also your reminiscences about life in tropical north Queenland. Jane and I are following your handy hints – with the vegies, I’ve become a bit addicted to a spoonful of Thomy mayonnaise on the side. Planning low GI vegetarian fried rice for a dinner catching up with Jane tonight. Hi Jane’s cousin and welcome on board. Glad you’re enjoying the blog. Hope the rice was good! Looking forward to your first cooking video. I am hoping we will get to see it first here on your blog! I’m lucky that I actually do really like vegetables! But, it is true that it takes a lot of time to do anything interesting with them. The kids don’t like onions, mushrooms and peppers so I usually end up just steaming one vegetable for them and then I eat the leftovers. Talk about boring! I used to make a nice roasted veggie dish with zucchini, peppers, eggplant and red onion. Very similar to your dish except near the end I added balsamic vinegar. Delicious! I love salad too but the problem is there isn’t much in France in the way of low-fat salad dressing. What do you use on salad? I make regular vinaigrette with 6 parts olive oil, 1 part lemon juice and 1 part balsamic. Dr Sejean says you need at least a tablespoon of oil a day. I use real butter too. If you make mixed vegetables in ziplocs you can adapt to each taste. Different colored vegetables are more attractive to kids and steaming keeps the colours. Most kids don’t like vegetables but acquire the taste as they get older. Mushrooms, onions and peppers are not easy to digest. Aubergines cut in four and microwaved are great with a bit of olive oil. BTW raw fennel cut thin with sliced mushrooms and Parmesan shavings is delicious. I love to roast veges and particularly love roasted broccoli and cauliflower. I always add balsamic vinegar as well as olive oil so it caramelises nicely. That’s a good idea about the balsamic vinegar. I’ll try it!